Wentworth By the Sea, A Marriott Hotel & Spa commands the island of New Castle, one of New Hampshire's oldest settlements. Masterfully blending historic elegance with 21st century convenience, our luxury hotel provides a memorable backdrop for business conferences, family vacations, and romantic getaways. 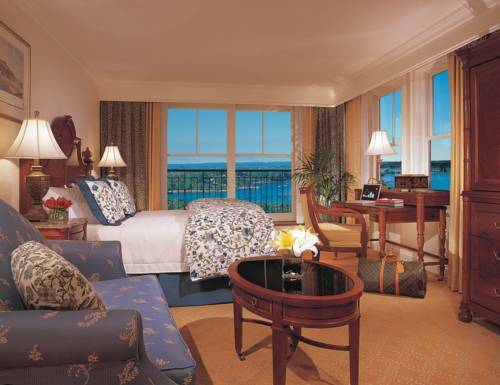 The Wentworth features 161 elegant rooms and suites, brimming with luxury perks; many showcase ocean views. Intimate restaurants with imaginative cuisine, pampering spa services, indoor and outdoor pools, fitness and business centers, and wireless Internet are all yours to enjoy during your stay here in New Castle. If you're hosting an event in the Portsmouth area, our hotel offers 10,000 square feet of flexible space and expert planning services. And there is no shortage of wonderful things to do here in New Castle and the surrounding area - from visiting Water Country to exploring historic downtown Portsmouth. A grand resort experience is yours to enjoy at Wentworth by the Sea, A Marriott Hotel & Spa. SALT Kitchen & Bar: Celebrate delicious American dining and craft cocktails with us at SALT! SALT is a re-imagined restaurant experience here in Portsmouth, combining the Wentworth's historic charm with a keen eye for contemporary style. Latitudes Waterfront: Enjoy a light-hearted take on the Portsmouth region's culinary bounty in the comfortable atmosphere of our waterfront restaurant. Open seasonally, Latitude's bistro-style menu features local ingredients prepared and presented with flair.